A special bottle can change your life. Just ask Matt Mollo, co-owner of the North End wine shop The Wine Bottega. That head-turning pour for Mollo was a fizzy red lambrusco, which he had in Italy in 2010. He and his wife, Adriana, were at a salumeria in Mantova, Lombardy, across the Po River from Emilia-Romagna, the region most associated with these lightly sparkling quaffs. On the banks of a lake, they picnicked and savored a special bottle of Fondo Bozzole “Incantabiss” (“snake charmer” in the local dialect). Lambrusco, a family of grapes with more than 60 sub-varieties, may not prompt everyone to make life-altering decisions. But the dry, artisanal versions surely inspire. Once only associated with the sweet commercial varieties that flooded the market in the 1970s and ’80s (remember “Riunite on ice”? 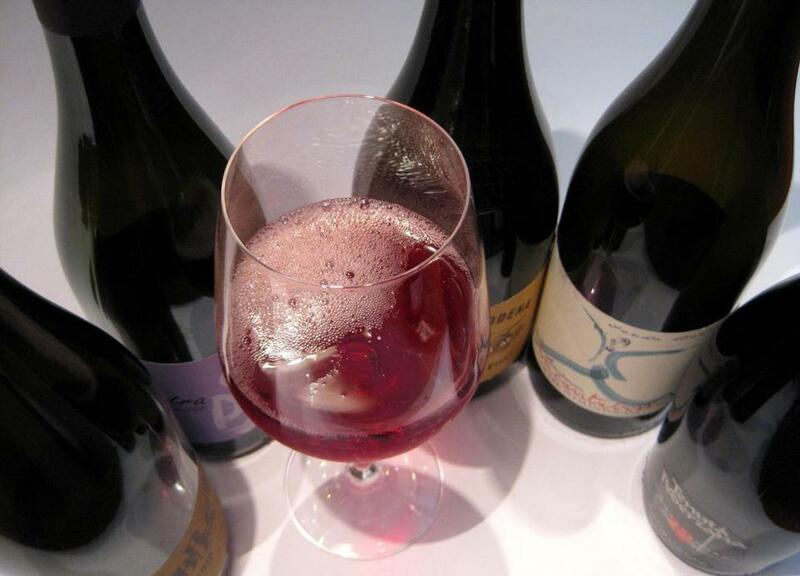 ), traditional lambrusco is refreshing and, in the right hands, appetizing and dimensional. The bubbles in these reds (some styles are made as white or rosé) always prompt conversation. Chubby corks dislodge with an explosive pop, but these wines are frizzante (softly sparkling), so while bubbles froth at the surface, they quickly settle down. Effervescence in most bottles is created by the charmat method, in a sealed tank. Some harder-to-find pours are made in the manner of champagne — secondary fermentation takes place in the bottles in which they will be sold. “Incantabiss,” the wine that launched Mollo’s importing company, goes through most of its fermentation in stainless steel, bottled in early winter with fermentation finished in the bottle on the lees, resulting in an earthy, nuanced wine. Best served chilled, lambrusco is full of lip-smacking acidity. It is a natural with salumi and the rich dishes made in and around Emilia-Romagna. Think Bolognese sauce, eggy pastas, and sausage braised in balsamic vinegar — or a splash of lambrusco itself. It’s also a terrific pizza wine. Yet restaurateurs will tell you that customers rarely ask for it. We sip a Lini 910 Lambrusco Rosso Emilia 2011, offered by the glass, paired with a platter of prosciutto, olives, and cheeses. The frothy, chilled red cuts through the richness of the nibbles, leaving us craving more. Tonight, that’s all of the inspiration we need. Fondo Bozzole “Incantabiss” Lambrusco Oltre Po Mantovano 2011 This ruby-purple frother leads with back-to-the-earth aromas, then blooms with black raspberry, balsamic-like bitterness, and appetizing tannins. Around $18. At The Wine Bottega, North End, 617-227-6607; Central Bottle Wine + Provisions, Cambridge, 617-225-0040. Lini 910 Lambrusco Rosso Emilia A lovely, rich style with fine froth and deep color to match. Soil and saline aromas lead to a palate of black cherry and food-friendly acidity. Around $16. At Cambridge Wine & Spirits, Cambridge, 617-864-7171; Marty’s Fine Wines, Newton, 617-332-1230. Podere il Saliceto “Falistra” Lambrusco di Sorbara Secco Sporting a rosy pink that is characteristic of the Sorbara style, this unfiltered pour from a tiny organic estate outside Modena is full of rustic, soil-driven aromas and bracing tartness. Around $20. At The Wine Bottega; Streetcar Wine & Beer, Jamaica Plain, 617-522-6416. Cleto Chiarli e Figli “Vecchia Modena” Premium Lambrusco di Sorbara Secco 2011 This blush pink quaff offers salumi-like aromas intermingled with notes of red fruit. It is whisper-light, effervescing with tart cherry. Around $13. At The Spirited Gourmet, Belmont, 617-489-9463; Needham Wine & Spirits, Needham, 781-449-1171. Tenuta Pederzana Della Tradizione Lambrusco Grasparossa di Castelvetro 2009 A spicy nose full of black cherry develops licorice-like aromas with a little time. Showcases finely textured fizz, gastronomic bitterness, and concentrated ripe fruit. Around $16. At Winestone, Chestnut Hill, 617-264-0393; Wollaston Wine & Spirits, Quincy, 617-479-4433.